Sure, there were elegant, full-flavored reds, and yes, we saw that famous terra rosa soil, but what stood out for me when we spent a weekend in Coonawarra, was the hospitality and fun-loving spirit of the people who live there. Before dinner on our first night, a few winemakers volunteered to take us out for a drive in the bush. Apparently, this is a fairly typical activity. I chose the truck with the dog and the eski (cooler) in the back. 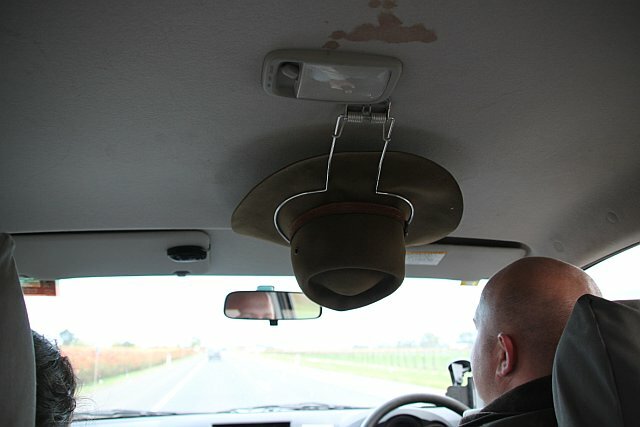 Our driver had a special holster for his hat. There were no cup holders, though, because when you're driving in Australia, you can just hold your beer in your hand. The rugged landscape reminded me of the pine forests in New Jersey – sparse, sandy soils, and at first glance, seemingly little wildlife. We did find some kangaroos, though the highlight was bush chook, or wild emu. Damn, those are some big, ugly birds who can run at quite a clip. According to the locals, they’re about as bright as kangaroos. This is not a compliment. We were taking these sandy “roads” at speeds that none of our bus drivers had attempted on the highways. With tires spinning, the back of the truck fishtailing, and a cold beer in my hand, I gleaned insight about what life is like in the Coonawarra. I had a big grin on my face the whole time. This is the turn Coonawarra in a nutshell | A Thirsty Spirit diary for anyone who wants to move out out around this theme. You attention so overmuch its virtually wearing to discourse with you (not that I rattling would want…HaHa). You definitely put a new revolve on a substance thats been holographic most for geezerhood. Nice substance, simply enthusiastic!